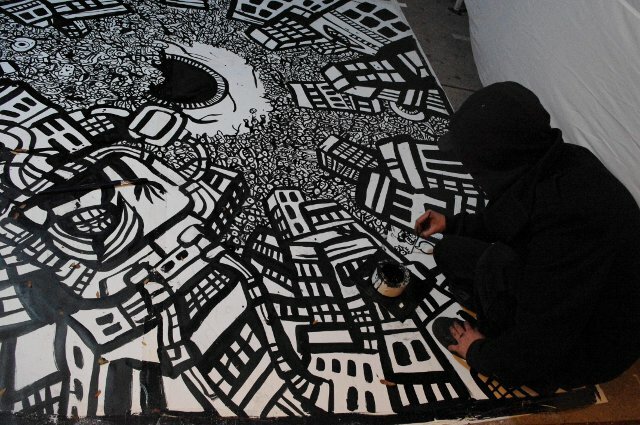 ART GRAFFITI STREET! 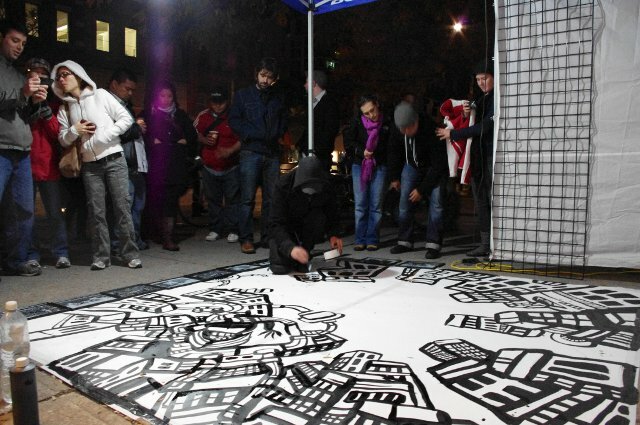 In 2009 I set up live paintings as an officially selected independent project in Toronto’s Nuit Blanche festival. I also took part as an unofficial exhibitor the following year. Using the same location as I had during my years as a full time street performer I returned to Queen St. West for these one night only extravaganzas. The annual party runs from 7 pm to 7 am and is flooded by art-lovers, alcoholics and anonymous lunatics of all kind. 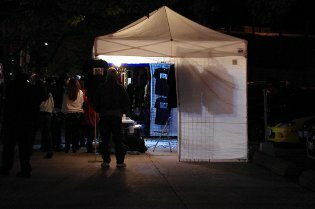 Although I had stopped doing regular street performances at the end of 2008 I couldn't resist the opportunity to get out and mingle with all the strange people at Nuit Blanche. And I have to say it was well worth the effort. 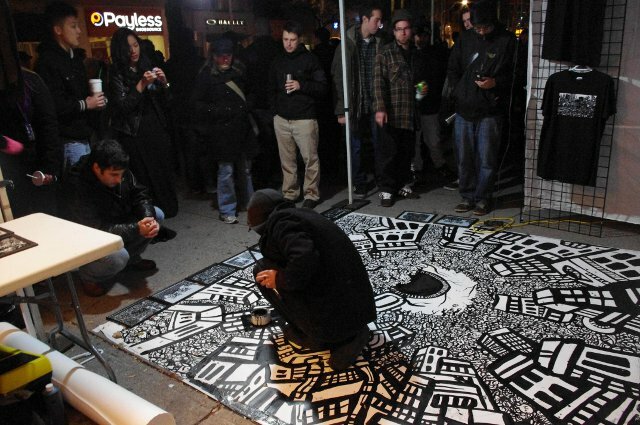 For the shows I did 15 x 15 ft. live paintings on the sidewalks of Queen West. 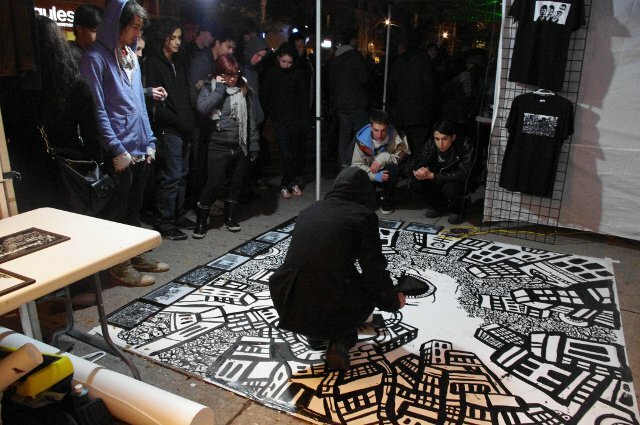 The best part about Nuit Blanche is the high energy and exceptionally aggressive and interactive party-goers. The entire night is a surreal amalgamation of yelling, flashing cameras, drunken jokes and unusual conversations. I feed off the crowds and the bigger and more excited the audience becomes the faster and crazier I paint. The all night festivals are the best for this sort of thing because the crowds are enormous and full of surprises. Like goblins and ghosts, people also tend to reveal a different side of world after the sun goes down. 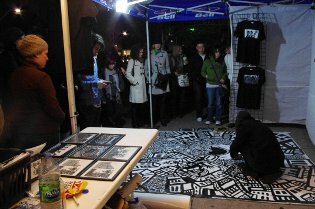 Some of the most dream-like occurrences magically come to life during white nights of Nuit Blanche. 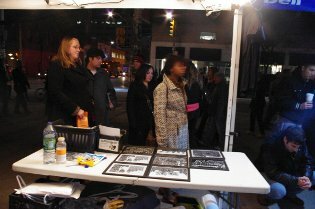 I recall spontaneous ballet dancers, jazz players and costumed performance artists passing by and interacting with my booth on Queen Street. On one occasion a DJ booth sprung up out of nowhere and before I’d even realized it I was painting in the middle of a rave! This happening was unbelievably well time too because only a few minutes before my own stereo had failed. I really enjoy working as a street performer during Toronto’s Nuit Blanche because you never know who or what will happen next.